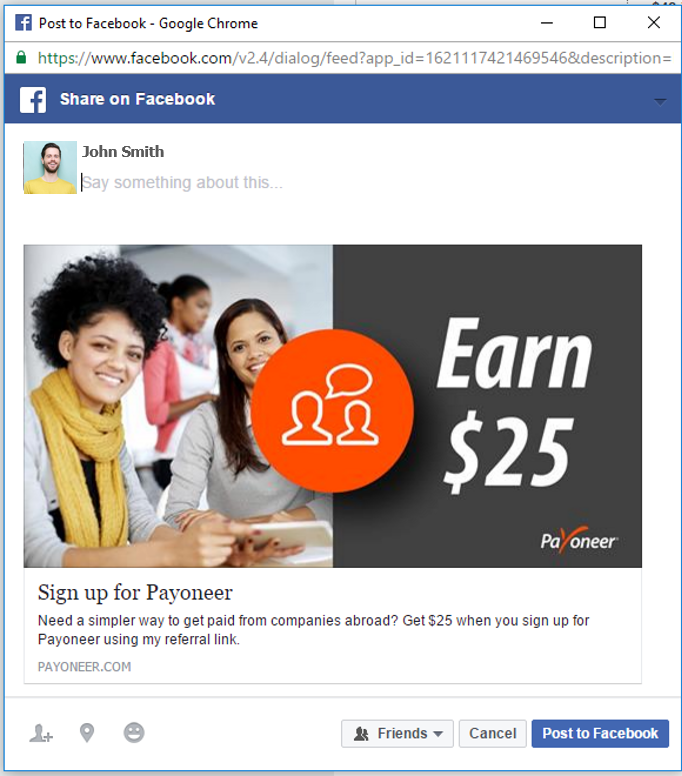 The Payoneer Refer A Friend program is a great way to earn extra cash simply by telling your friends about Payoneer. Today, we’re excited to let you know that the Refer A Friend program has been upgraded! You can now access your Refer A Friend details directly from My Account. In addition, you will have a personalized dashboard with the ability to share, monitor and track your referrals…all in one place! 2. From the main menu, click Activity and then Refer A Friend. 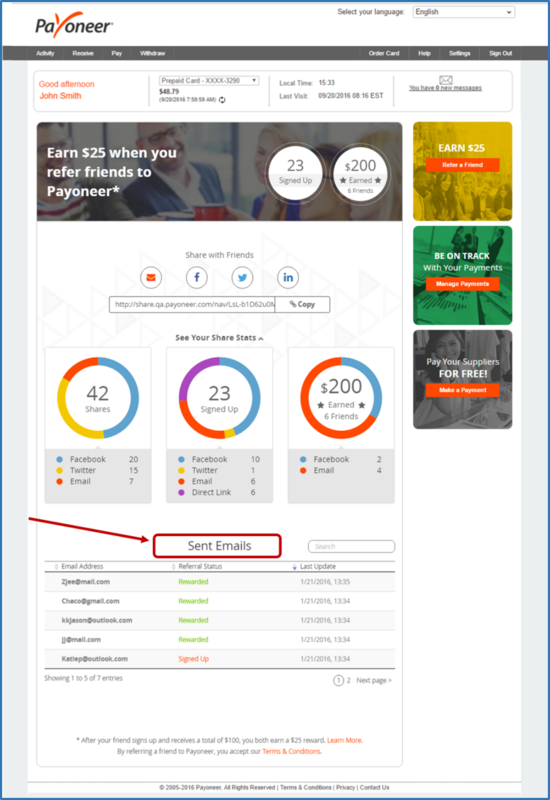 *Note that these figures will only be displayed if at least one friend has signed up to Payoneer via your referral. Your referral link (URL) is displayed below the share icons. You can copy and paste this link into a website, blog post, landing page, etc. 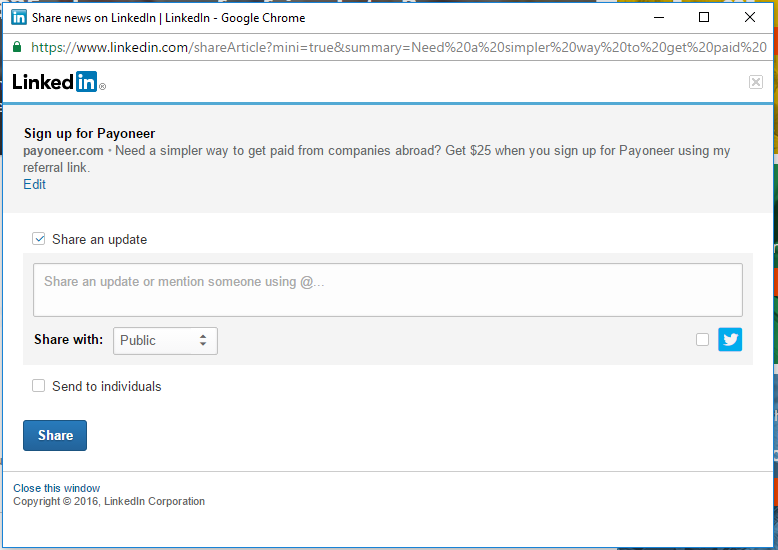 or you can share your link via email or directly to your Facebook, Twitter and LinkedIn feed. Select whether you want to post this link to only individuals, or automatically share with all of your LinkedIn groups as well by clicking the corresponding box. You can now monitor your referral stats and track sent emails from directly inside My Account. To view statistics regarding your Refer A Friend activity, click See Your Share Stats. 1. Shares – this is the total number of referrals that you have shared via all available methods. Below the circle is a breakdown of the total number, categorized according to referral method. 2. 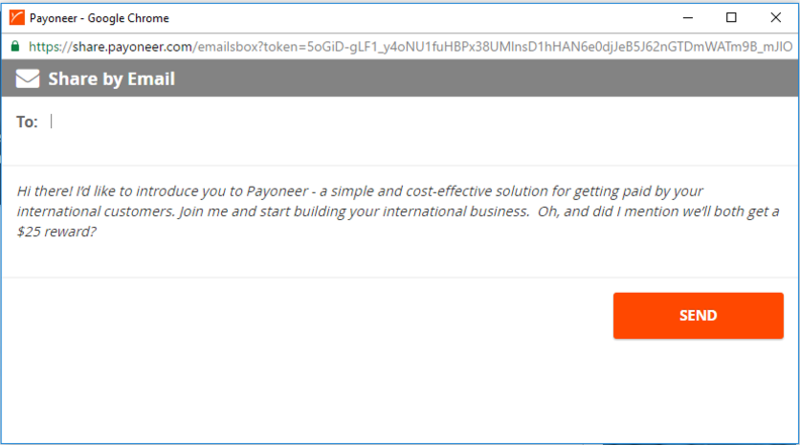 Signed Up – this is the number of friends that have signed up to Payoneer using your referral link. Below the circle is a breakdown of the total number, categorized according to referral method. 3. Earned – this is the amount of money that you have earned, to date, in the Refer A Friend program. The total amount appears together with the number of friends that have also received rewards. 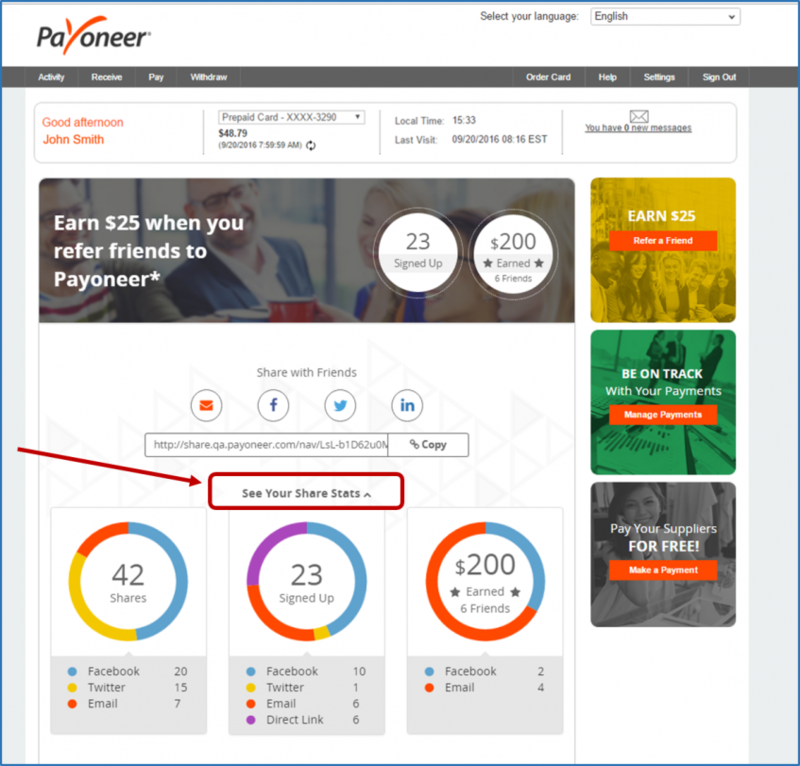 Below the circle is a breakdown of the total amount, categorized according to the referral method by which your friend signed up to Payoneer. Why don’t I see my referral stats? If you have been an active user in the previous Refer A Friend program, your accumulated stats will automatically be exported to the new application; however, they will not be categorized according to referral method. These figures will instead be categorized as Till Dec. 2015. 1. Email addresses – this is the email address of the friends who received your referral link. 2. Referral Status – this is the current status of the referral. Rewarded – your friend has earned at least $1,000. Both you and your friend are rewarded $25. 3. Last Update – this is the date and time at which the referral status was updated. Use the triangles by the column heading to sort in ascending or descending order. Use the search box to locate a specific email address. Scroll through the list by clicking Next at the bottom right of the list. 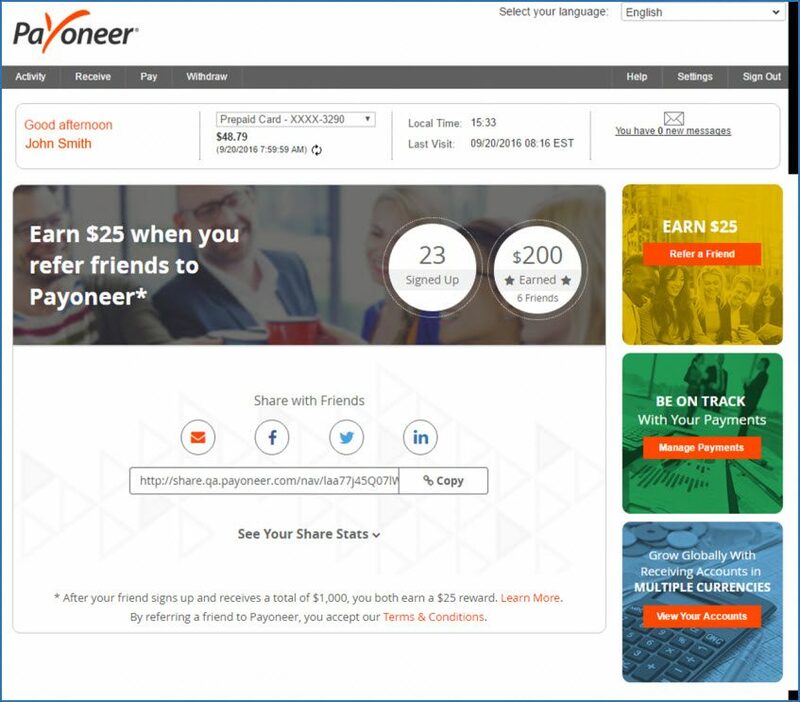 You now have all the tools and information you need to start referring your friends to Payoneer and receive rewards. 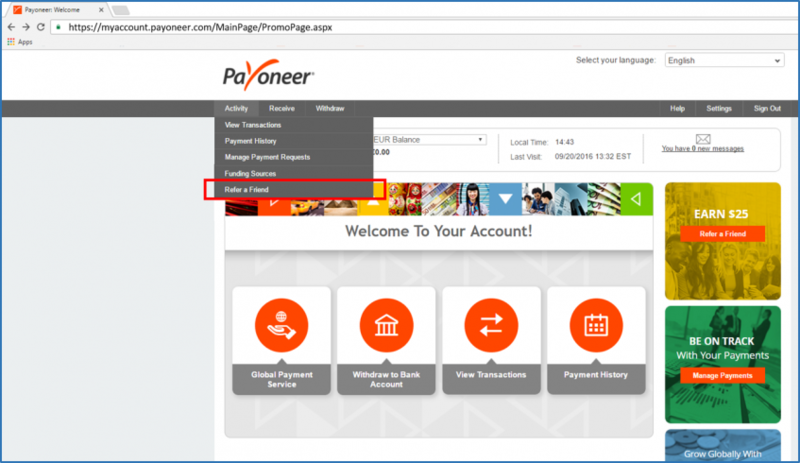 To view your personal referral link, log in to Payoneer!